Nathan has been going to Kindergarten Club this summer. It's a program that helps kids get ready for kindergarten. They do all kinds of neat things and themes. I should know, as I have gone through the program several times now LOL! This week they learned about bus safety. They also went on a bus ride. Nathan said the same thing all my other children have said "there isn't any seat belts on here...."
Going along with the theme, we went to the library in search of bus books. We ended up borrowing two. Bus Stop, Bus Go by Daniel Kirk and School Bus by Donald Crews. And we made a school bus craft. As busy as we have been the last few weeks, I kept this one as simple as possible. 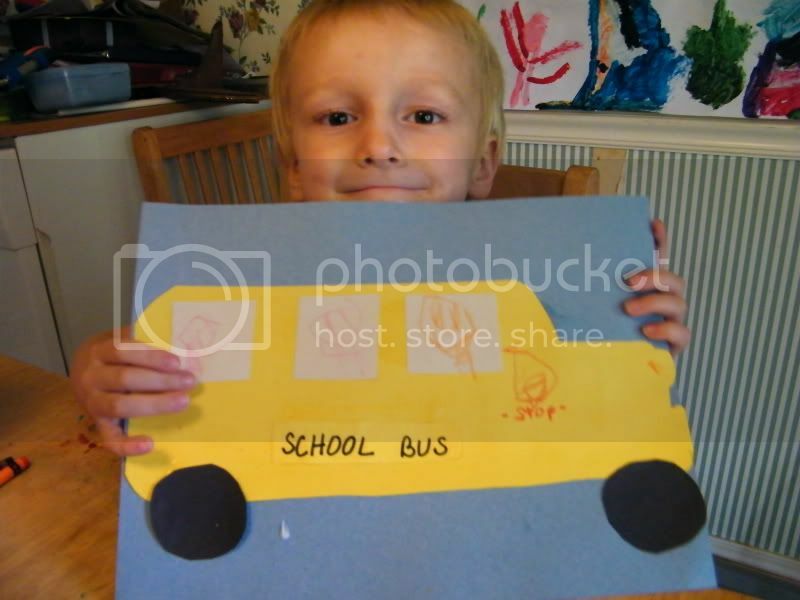 Especially since he did another bus craft at Kindergarten Club and received several print outs from the bus safety teachers/drivers. We also learned some more about shapes with our project. Buses are rectangles and wheels are circles, etc. 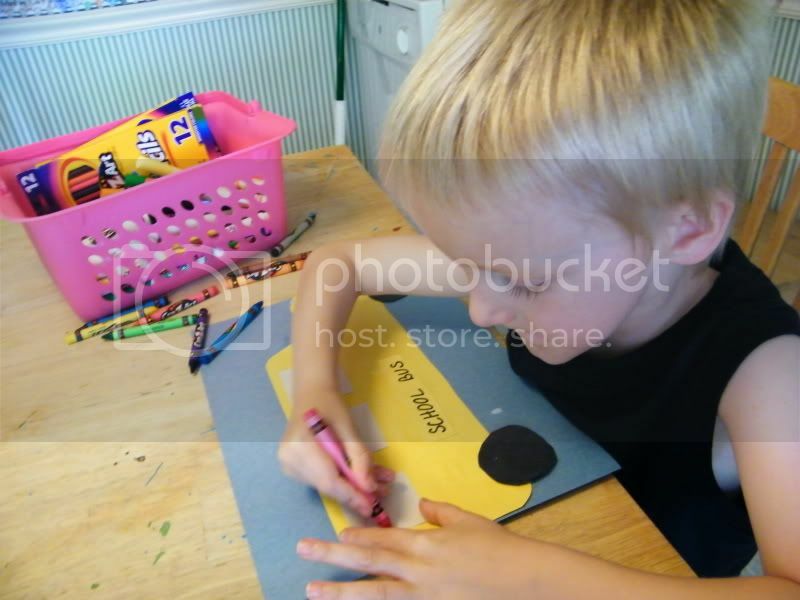 We cut out a big rectangle for the bus and some circles for the wheels, some squares for the windows and glued them all to a piece of construction paper. Then Nathan drew people in the windows. 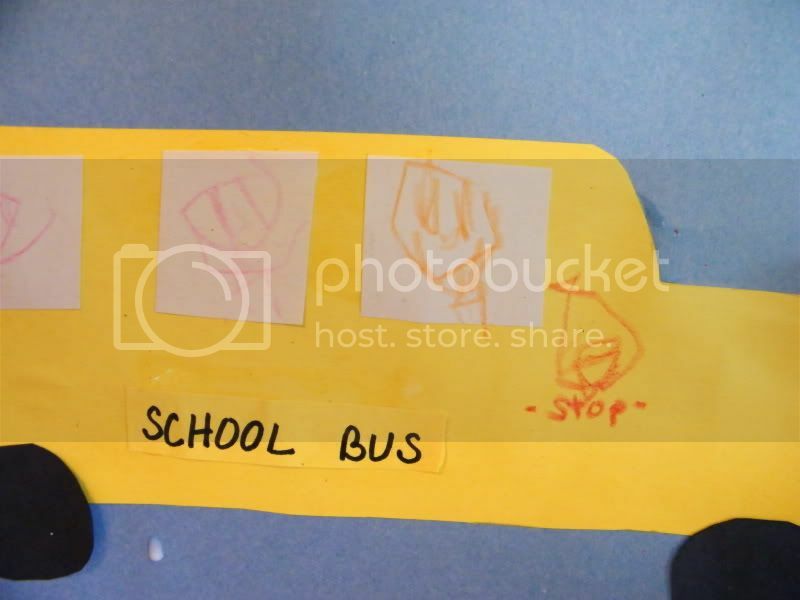 He also remembered that school buses have a stop sign on them, so he drew one on his bus. And asked me to write "stop" on it. He was feeling pretty cranky today from all the activity he's been doing lately (K.C. and library story time) that I thought it was best to keep it simple. Plus, we did the Cupcake book earlier this week too, so I figured he's getting plenty of stimulation. Thanks for sharing. I think the program that your school district is running is an excellent idea! It really provides the child a chance to get to know the ropes of attending school. I loved the projects that you incorporated into what he was learning! Great pic, Nathan! I think we are going to borrow the Cupcake Book from our local library! Great program. I kinda miss those days....sometimes. I love the stop sign on the bus.